Consider treating teething pain with a teething ring made of firm rubber (not frozen) or by rubbing the gums with a clean finger. Read this article and watch these videos to learn more. 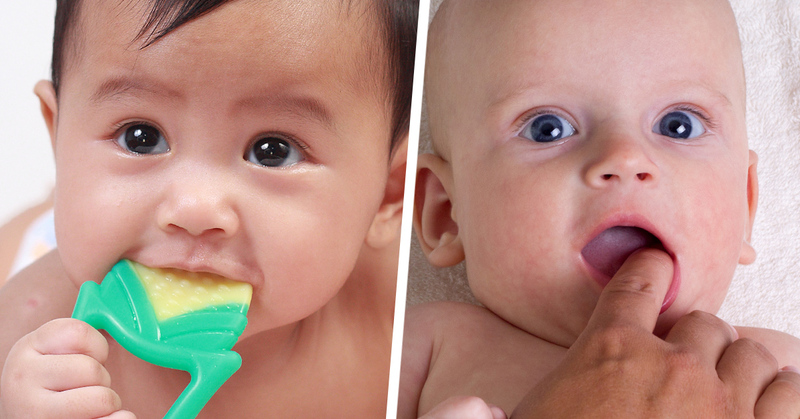 Teething is normal but may be a painful experience for infants and toddlers. Too often, well-meaning parents and caregivers who want to ease a child’s pain turn to medications and products that could be harmful. Soothing children’s gums with prescription or over-the-counter (OTC) drugs, homeopathic drugs, or teething jewelry marketed for relieving teething pain may seem like good options. But those products can be dangerous and can lead to serious injury or even death. This also applies to older children with special needs who may use teething jewelry for sensory stimulation. The American Academy of Pediatrics (AAP) recommends alternative ways for treating teething pain, including rubbing infants’ gums with a clean finger or providing a teething ring made of firm rubber to chew on. For children with sensory stimulation needs, parents and caregivers should talk to their child’s health care provider about safer options. On average, children begin teething around 4 to 7 months, and have a total of 20 “baby teeth” by age 3. According to the AAP, occasional symptoms of teething include mild irritability, a low-level fever, drooling, and an urge to chew something hard. Teething jewelry includes necklaces, bracelets, and other jewelry worn by either an adult or child, used by parents and caregivers, and is marketed to relieve an infant’s teething pain. It may also be marketed for use by people with special needs, such as autism or attention deficit hyperactivity disorder, to provide sensory stimulation or redirect chewing on clothes or body parts. The beads of the jewelry may be made with various materials such as amber, wood, marble, or silicone. Jewelry marketed for teething is not the same as teething rings or teethers, which are made of hard plastic or rubber and not wearable by an adult or child. There are serious risks associated with using jewelry marketed for relieving teething pain such as choking, strangulation, injury to the mouth, and infection. Other concerns include potential injury to the mouth or infection if a piece of the jewelry irritates or pierces the child’s gums. Parents and caregivers might also look to relieve a teething baby by rubbing numbing medications on the child’s gums. But the U.S. Food and Drug Administration (FDA) warns against using any sort of topical medication to treat teething pain in children, including prescription or OTC creams and gels, or homeopathic teething tablets. They offer little to no benefit and are associated with serious risk. Benzocaine — a local anesthetic — is the active ingredient in several OTC oral health care products such as Anbesol, Baby Orajel, Cepacol, Chloraseptic, Hurricaine, Orabase, Orajel, and Topex. These products should not be used for teething because they can be dangerous and are not useful because they wash out of a baby’s mouth within minutes. The use of benzocaine gels, sprays, ointments, solutions, and lozenges for mouth and gum pain can lead to a serious — and sometimes fatal — condition called methemoglobinemia, in which the oxygen-carrying capacity of red blood cells is greatly reduced. Prescription and OTC benzocaine oral health care drug products are also widely used in adults. Doctors and dentists often use sprays containing benzocaine to numb the mucous membranes of the mouth and throat or to suppress the gag reflex during medical and surgical procedures, such as transesophageal echocardiograms, endoscopy, intubation, and feeding tube replacements. But benzocaine sprays are not FDA-approved for these uses. Talk to your health care professional about using benzocaine and other local anesthetics, especially if you have heart disease; are elderly; are a smoker; or have breathing problems such as asthma, bronchitis, or emphysema. Those conditions put you at greater risk for complications relating to methemoglobinemia. If your child’s gums are swollen and tender, gently rub or massage the gums with your finger, or give your child a teething ring made of firm rubber to chew. Make sure the teething ring is not frozen. If the object is too hard, it can hurt your child’s gums. Parents should supervise their children so they don’t accidentally choke on the teething ring. Parents and caregivers of children with special needs who may require sensory stimulation should talk to their child’s health care provider about safer options and treatment. Jewelry marketed for relieving teething pain and to provide sensory stimulation can lead to serious injuries, including strangulation and choking. The FDA continues to closely monitor the use of teething jewelry and other teething pain relief products and is evaluating whether other actions are necessary to address the risks associated with these products, as part of its commitment to protecting public health – especially when it comes to the health and safety of children. Consumers and health care professionals should notify the FDA of any adverse side effects when using drugs and devices the agency regulates, by reporting them online to MedWatch, the FDA’s safety information and adverse event reporting program, or by telephone at 1-800-FDA-1088.